The Dennerle Dosator made from high-quality plastic works according to the principle of osmosis. Water from the aquarium "seeps" through the semi-permeable special membrane into the reservoir, pushing the nutrient solution drop-by-drop via the riser into the aquarium. This has two effects: firstly the aquarium gets the amount of fertiliser it needs, and secondly: the Dosator becomes a "tank indicator": as the water enters bit by bit and pushes the fertiliser into the aquarium, the fertiliser-water mixture in the Dosator becomes increasingly clear. When the contents of the dispenser lose their colour (S7 orange, V30 yellowy-green) you know it is time to fertilise. Aquarium plants benefit from the constant, even supply of nutrients like in nature. This ensures healthy, even plant growth and allows the aquarium to shine with magnificent, rich green splendour. The disadvantages of an excessively high nutrient concentration caused by bursts of fertiliser are a thing of the past. And the best thing: The overall lower nutrient level and the need-based supply of nutrients to the plants is extremely effective in preventing algae growth. 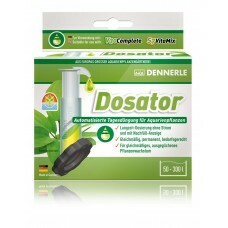 The Dosator is specially designed for the Dennerle fertilisers V30 Complete and S7 VitaMix.V30 is dispensed automatically over 4 weeks; S7 over the space of 1 week. The Dosator has been developed especially for use with V30 Complete and S7 VitaMix as part of the Dennerle fertiliser system:V30 is automatically dispensed over 4 weeks, S7 over 1 week (2 Dosators are needed for this).The innovative fertiliser dispenser, made from high-quality, durable plastic, can be used to supply aquaria from 50 to 300 litres. The Dosator is ideally suited to use with V30 as an all-purpose fertiliser and ensures even, drop-by-drop fertiliser addition over the course of a month. As the Dosator works purely on the principle of osmosis and does not have any moving parts or require batteries or a power supply (like a dosage pump/fertiliser dispenser), it operates very safely and economically. It also offers considerable advantages compared with a classic daily fertiliser, as the device only needs to be refilled once a week (S7) or once a month (V30).